news The Commonwealth Bank of Australia has revealed plans to launch a new combination smartphone application and associated hardware accessory that allow customers to make quick payments from their mobile phone to anyone with an email address, phone number of Facebook friendship, as well as to merchants via near field communications (NFC). Dubbed ‘Kaching’ to mimic the sound of a cash register draw closing, the app will initially launch on Apple’s iOS platform, although a version for Google’s rival Android operating system is in the works. However, the Apple version has not yet been submitted to Apple’s online store for approval. According to a statement issued by the bank this morning on the new app, customers who download Kaching will be required to complete a “straightforward” registration process to use it, utilising their online NetBank login details. They will then select an account to both receive and make payments from. The app will then allow the user to make payments to “anyone” via an email address, phone number or Facebook friendship. Depending on the format selected for payment, the bank said, the transaction would either take place instantly, or generate a unique code for delivery to the recipient, allowing them to access their payment online “at a convenient time”. Because Apple’s iPhone line does not support the Near Field Communications standard (unlike a number of rival Android phones), NFC payments — or ‘tap to pay’ at merchant terminals supporting MasterCard’s PayPass standard — will take place through the addition of an iCarte case to customers’ iPhone handsets. The bank noted there were some 42,000 NFC readers currently installed around Australia. The iCarte case is only compatible with iPhone 4 and 4S models, while Kaching will require iOS version 4.3. ZDNet.com.au has reported the iCarte case will cost $40 or $50. The app will also allow customers to check their balances and transfer money between their accounts, in addition to allowing bills to be paid through the BPAY system. The app will be locked to only one smartphone handset for security, users’ passwords will be encrypted and no personal banking information will be stored on customers’ phones. In addition, all funds which are not retrieved through the system after 14 days will be credited back to the original payer. CommBank is billing the app as a “peer to peer” social payments strategy that is differentiated from current legacy payments systems. “This banking breakthrough marks a significant milestone in the evolution of how we pay and receive money from each other,” said CommBank chief information officer and group executive of enterprise services, Michael Harte. “CommBank Kaching joins our suite of apps and further validates our position as Australia’s most innovative bank and a world leader when it comes to digital development in financial services,” he added. The bank’s executive general manager of cards, payments and retail strategy, David Lindberg, said the new app would reduce the reliance on traditional payment methods and simplify everyday payments. “Mobile and online social payment is the next step in transaction technology,” he said. “Already, more than half our 10 million customers own a smartphone, and Australians are 65 percent more likely than the British to bank on their phones. Now, for the first time, Australian consumers will no longer have to rely on cash or cards to make payments to family, friends or even businesses. The recent explosion in uptake of digital and smartphone technology has revolutionised how we all transact, interact and communicate with each other, and this new application will make the dream of mobile payments a reality,” he added. The bank has set up a registration page for customers who want to pre-register their interest in the service. Along with similar apps such as ANZ Bank’s goMoney system and Pollenizer’s Pygg, Kaching represents (finally!) the eventual long-term deprecation in the use of cash in Australia. And it’s about time. With the technology that we have on hand today, there is simply no reason for consumers in first-world countries such as Australia to be paying cash for items or giving each other cash for small transactions. It’s simply much more logical for Australians to be tapping their smartphones or use an app for these kind of payments. I suspect I’m not the only one who is tired of carrying around coins in their pocket … a monetary system which dates back several milennia. However, there are also some potential privacy issues here. 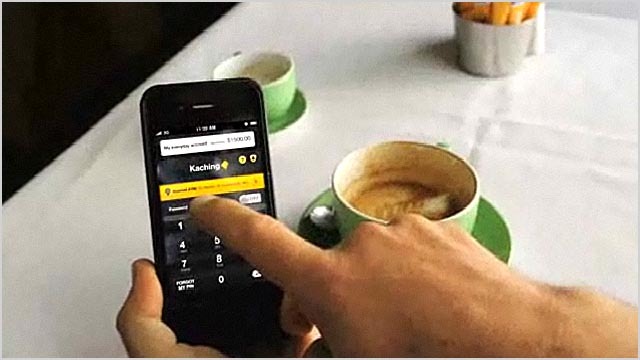 Kaching does something very nice for the Commonwealth Bank — it’s not just another service offering to customers. Used correctly, it will also place vastly larger amounts of data in the company’s systems than it previously had available to it. Every time a customer pays a mate for a coffee, forks out a few dollars for an item at a shop or chucks some spare change a charity’s way online through this system, it will now be able to be tracked, where previously it could not be. It used to be that coffees with mates were private. It used to be that you could pay cash for something in a shop and that transaction wouldn’t be recorded against your name. It used to be that you could chuck some spare change into a charity’s bucket without the world knowing. Well, if CommBank has its way, this will be the case no longer. All of that valuable data will be saved and added to your transaction record. I note that nowhere in this morning’s announcement was there a proposal that small transactions carried out by customers through Kaching be anonymised, as they currently are with cash. And yet, with many of the cashless cards available internationally, this is possible. The cards and transactions do not have ‘owners’ — they are simply used, as cash is. With the release of Kaching, CommBank is making more than a play for customer loyalty and convenience. It is making a play to view the sum total of all of your monetary transactions — from birth to death. And that — in the wrong hands — would be an extremely dangerous thing. How will payments between financial institutions be handled? If this is a walled garden with both the payer and payee needing to have Comm Bank accounts I see this as being significantly less useful. True the Commonwealth has the biggest share of the retail banking market but Westpac has more business banking share and you need the merchants to make this work. With the collapse of the MAMBO payments hub I’d like to see how Comm Bank will handle this themselves. If I understand it correctly, a payee on another bank logs into the CommBank’s portal through the one-time password they have been sent, then transfers the money into their external account. Or, at least that’s how it works with ANZ goMoney. It’s a system which seems to work pretty well. Pity about the name. Kaching sounds ridiculously childish in my opinion – though the product and value proposition seems pretty solid. So, the Apocalypse is upon us. Thanks, CBA. I’m not sure they can anonymise without compromising security. You can trade off some physical security for a high level of privacy with cash because there is a physical token to track transactions. However with electronic transaction systems you need an audit trail of some kind.